Last week, Priya needed immediate cash as one of her family member was hospitalised. She was reluctant to ask for help from her friends and searching online for various financing options. She came across Personal Loan facility, but the thought of lengthy documentation process was a strong deterring factor. Like Priya do you too resistcredit facilities? Or you feel you do not earn enough to apply for a loan? Then you must read this guide. Because we will be talking about Personal Loans. We will debunk your myths about personal loans and will unfold the real picture about personal loan. Chapter 1: What Is Personal Loan? Chapter 2: When Can I Opt For Personal Loan? 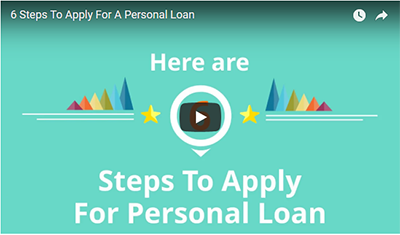 Personal Loan is unsecured loan advanced on the basis of your credit history and ability to re-pay the same from your personal income. It is also called as consumer loan. It is a multi-purpose loan which you can borrow to meet your immediate needs. Do you wish to renovate your house? Or fix a car or need some funds for a holiday or your wedding? Then Personal Loan would be a reliable instrument to source some funds. As personal is an unsecured loan, interest rate on personal loan is generally higher than home loan or car loan. Hence, you need to know your finances well in advance before you opt for one. Being a multi-purpose loan, there is no fixed time to apply for Personal Loan. Rather you can choose personal loan for almost every requirement. Hence, personal loans are most preferred options for financing your immediate needs. Loan approval is quick and easy. Additionally, documentation required are minimum. Being an unsecured loan, there is no collateral of any asset required. It is offered on the basis of your credit history and repayment capacity. Many abhor applying for personal loans due to lengthy documentation process. But personal loans are approved with minimum documentation. These days it takes few hours for loan disbursement. If banks feels that you have the capacity to re-pay the loan within the stipulated time and need loan for genuine reason then getting a personal loan disbursement is easy. Rate of interest on personal loan is fixed at the start of the tenure and remains constant throughout. So, it becomes easy for loan applicants to plan for their future EMIs well in advance. Personal loans offer loan tenure ranging from between 1 year to 5 years. So you have flexibility to choose your tenure as per your re-payment plan. Best is to opt for a lower tenure loan and save on the interest outlays. Equated Monthly Instalments make the idea of loan simpler. 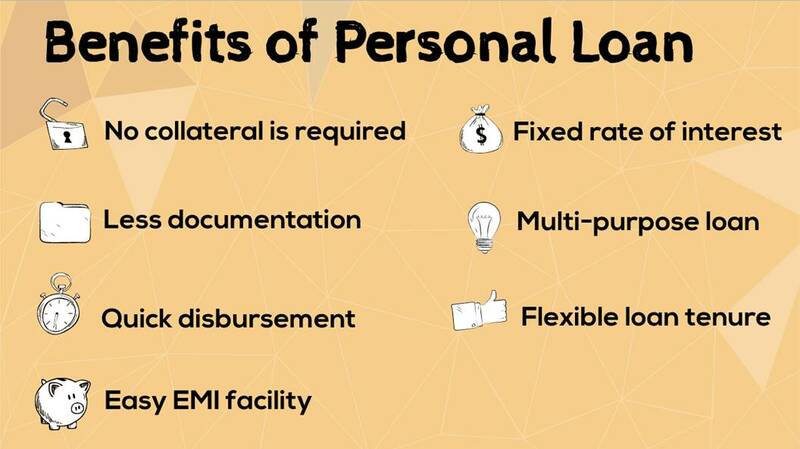 Personal loans too offer easy EMI facilities and help you re-pay the principal amount over the tenure. Unlike home loan or car loan, personal loans can be availed to meet almost all aspirations. So benefits of opting a personal loan are galore, but check your eligibility criteria in next chapter. Personal Loan is an ‘unsecured loan’, and banks conduct a thorough due diligence. Most importantly they check your financial stability. Loan eligibility is dependent on several factors such as your credit score, monthly income, other ongoing EMIs, etc. These terms vary from one lender to another. If you are a salaried employee, then the age limit is 21-58 years. Age limit for a self-employed businessman or woman and professional is 25-65 years. Your net monthly salary is crucial to sanctioning your loan. Some lending institutions have a minimum monthly income criterion. While at some banks the eligibility criteria is Rs 25, 000 per month. Some of the basic employment types are salaried employees, professionals, Self-employed person or professionals. If you have been job-hopping in the recent past, an approval could be difficult. For instance, many lending institutions sanction loans to employees with at least two years work experience, and at least one year from your current employer. Similarly, self-employed professionals must have a minimum of three years of experience. Some consider your overall work experience. This is a score assigned to you by a credit information company (for example companies such as CIBIL, Equifax, High Mark). It gives a prospective lending institution, a perspective about your history as a borrower. A high credit score also gives you the bargaining power to negotiate better loan terms for yourself. Some banks have a minimum CIBIL Score requirement of 700, while some have 750. A score in the range of 700-900 is desirable. Learn how to get your credit score card for free! These documents along with the Personal Loan application form and few photographs need to be submitted to your lender. These days many banks and financial lending institutions offer online loan application facility as well. You must check these and apply for the best suitable option. Once the Personal Loan is sanctioned, duly signed loan agreement copy will be sent. You also need to provide a standing instruction request / ECS mandate form and security deposit cheques are to be provided. Personal Loan Interest Rates are one of the highest interest charged amongst the other categories of loan. Currently, personal loans are being issued at the rate of around 10% - 15% per annum. The rate of interest varies from bank to bank. It also depends applicant's income level, past credit history, existing EMIs and loans, loan tenure, credit score and so on. Along with the interest cost on personal loan, there will be some processing fee and other charges which you need to keep in mind. These days there are many calculators available online. You can use PersonalFN's Personal Loan EMI Calculator for your personal use. This tool will help you to calculate your future monthly instalments assigned for re-payment of your Personal Loan. With PersonalFN Personal Loan Calculator you can estimate your future EMIs. This will help you to budget your future finances and help you make responsible decision. R = Rate of interest calculated on monthly basis i.e. (R= Annual rate of interest/12/100). N = the number of monthly instalments. You need not make these calculations manually and rather use our Personal Loan EMI Calculator to make an informed decision. After reading so much on Personal Loans, we are sure you would like to know about the top personal loan lenders. And hence, we have created the list of top 10 personal loan providers in India. Please note that this list is indicative and not exhaustive. You must opt for loan from an institute providing best loan terms. The extravagant plans for a wedding day is never ending. And if you haven't planned well, these expenses can dissolve your savings. Most people cross the wedding budget, just to celebrate it in the best possible way. Many won't hesitate to borrow money when facing a shortfall. Similarly, Nirali Gada, a Chartered Accountant, is getting married in six months. Mr & Mrs Gada have a Rs 10 lakh wedding fund. A medical emergency last year liquidated a majority of their savings. Mr Gada enquired about credit opportunities with his bank. He was offered Wedding Loan. Wedding loan is a personal loan issued specifically to meet your marriage expenses. Often the wedding expenses overshoot and you or your parents would be compelled to borrow money from family or friends. You now can opt for a wedding loan without any hesitation. You can apply for a personal loan for wedding either at Non-Banking Financial Companies, and Banks, involved in lending and financing services. Many NBFCs and banks allow you to apply for a wedding loan online. If you earn a salary of Rs 15,000 per month from a registered organization, you will be eligible for a personal loan. A wedding loan ranges between Rs 5 lakh to Rs 25 lakh. These loan products are re-packaged and sold as wedding-day loans. Interest rate varies from one bank to another. Further, the loan amount and interest rate is different for every borrower. With a good credit score, you can negotiate for wedding loan with low interest rate. Hence, your EMI depends on your principal loan amount, rate of interest, and loan tenure. PersonalFN is of the view that, wedding is just a beginning of your new journey and not an end. And personal loans come at a cost. You can opt for wedding loans in case you are falling short of some amount to meet up the overall wedding expense. Avoid financing your entire wedding cost with the help of personal loan. Fix your finances and make some savings. Opting for a loan is not a bad option, but the fact that you have to borrow money it means you cannot afford it right now. Hence, be cautious and avoid making any hasty decisions which might land you in a debt trap situation. Also Read: Should You Finance Your Wedding With A Personal Loan? India is a country synonymous with culture; we celebrate several festivals all-year round. Each of these have their significance in the various state-communities of India and is celebrated with zeal and excitement. Festivals are even marked as auspicious dates to buy assets as a sign of progress and growth. Similarly, Rajeev, hoped to buy a home theatre system during the festival of Gudi Padwa. He is a marketing professional and works at one of the top travel companies. He receives hefty incentives as he meets his sales target. But, he was unsuccessful in achieving his sales target this month. What he received was below his expectations. Buying that home-theatre system had become a dilemma for Rajeev. He applied for festival loan and purchased home theatre without much delay. Festival Loans are another facility that banks and non-banking financial institutes usually launch during the festive season. 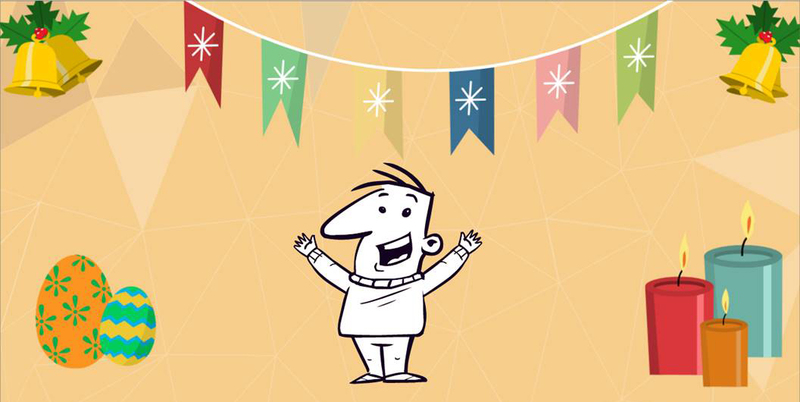 If a temporary cash crunch is about to hamper your festive celebration, opt for a festival loan. Almost all the lenders have their own set eligibility criteria. The minimum loan amount is Rs 5,000 and maximum Rs 50,000; only if it is four times your net monthly salary. The tenure of this loan is 12 months and the loan can be repaid in the equal instalments monthly. You can close the loan account and pre-pay it without paying any penalty. The loan processing fee is as low as Rs 100 or 1% of the loan amount + 18% GST. Interest rate charge is the range of 13% – 15%, but you can always bargain for a lower rate of interest. PersonalFN suggests you evaluate your current finances before making any impulsive purchases. Splurging with the credit facilities can eventually land you in a debt-trap. Living within one's means, safeguards one's long-term financial wellbeing. A Personal Loan can turn your dream vacation into a reality. Again, vacation loan is a personal loan packaged to finance your vacation. So, personal loan issued for the purpose of holiday or vacation is termed as Holiday Loan. You can avail the same after considering your current finances. When you take a Personal Loan, the interest outgo is one of the vital deciding factors. The interest rate you pay depends on a variety of factors: your age, income stability, whether salaried or self-employed, number of years of work experience (in the current job/business/profession) and total), your credit score, existing EMIs (if any), and your repayment capacity, loan tenure, among other things. The interest outgo determines your EMI and has a bearing on your budget and long-term financial wellbeing. So, make sure you apply for best personal loan rates. It makes sense to compare personal loan interest rates across lenders and opt for a lowest interest personal loan. The maximum tenure for a Personal Loan is usually 5 years. But the shorter the tenure of a Personal Loan, the better it is. A higher tenure can reduce your EMIs, making repayments comfortable, while opting for a lower tenure (of say 2 to 3 years) increases your EMI; you pay a higher interest cost on the Personal Loan. Taking a Personal Loan does not end with interest rates; there are processing fees and other charges levied by lenders. The processing fee is a one-time fee charged as a certain per cent of the Personal Loan amount, but subject to a minimum amount. It varies from lender to lender. A higher processing fee impacts your total cash outflow while you apply for a Personal Loan. The other charges include: stamp duty, late payment fee, cheque bounce charges, duplicate interest certificate issuance charge, duplicate statement issuance charge, duplicate amortization schedule charge, issuance charge for photocopy of loan agreement/documents, prepayment charges (also known as foreclosure charges) and so on, all of which these should be examined carefully. Apart from the above crucial aspects, assess if the lender provides you with the flexibility to repay your loan sooner, and what will this cost you. This flexibility can help you prepay the loan ahead of time, as well as provide a relief in distressing times. However, it's best to adopt financial discipline in order to repay the Personal Loan on time and maintain your financial health in the pink always. When you avail a Personal Loan in times of need, you wouldn't want it to be an unpleasant experience, do you? Hence, ensure the customer service at the lender has high standards. This service can even help keep track of your loan, allow you to be in better control of your personal finances. Remember, while lenders will have varying customer service standards, there are some basics of good service that are universal. A salary highlights the repaying capacity of the borrower. A lender requests a borrower to furnish the latest salary slips. A salary is considered adequate based on the loan applied for, expenses, outstanding loans (if any), and the city of residence, etc. Almost all Indian banks categorise employers based on size and popularity of the company. If your employer falls under the highest category, you may be eligible for a higher loan amount at a lower rate of interest and vice versa. Banks and other lenders may analyse the time period you have been working at the current job and even the number of years of work experience. A higher time span in your present job may work in your favour while procuring a loan. Lenders may also visit your employer to verify your details. A bank may not be hesitant in granting you a loan if you are settled and future prospects of earnings are bright, plus if you are residing in your current house for long. Make sure you read the terms &condition carefully to make an informed choice. This will avoid issues later and ensure a pleasant, hassle-free experience. You can also watch the video below to know more about these 10 factors. These 10 factors play a crucial role in finalising a Personal Loan. As highlighted above a personal loan charges a high interest rate. It should be opted only as a last resort. Now, if you have already taken a personal loan, and you lose your job. Or are facing a medical emergency. Or for whatever reason, you are unable to make the regular EMI payments. Do not be harsh on yourself and do not react in an extreme fashion. Remember this is not a rare situation. Banks have customers who default on payments all the time. We understand it is a tough time for you but stay calm and find a practical solution. It might feel like you are alone, but you aren't. There's no need to feel like you have a great weight on your shoulders that you have to carry it by yourself. In fact, your bank will be the first entity willing to help you. Defaulting on your loan, even if it is a home loan, is not the end of the road. Next step is to face the situation and contact your lender. Approach them and explain your current situation before matters get worse. Do not be scared and take charge of the situation. Call the lender and set up a meeting to calmly and rationally discuss your options. And before you approach them create a file containing all your past EMI payment details, notices sent to you by the bank if any, details of the loan such as date of taking the loan, tenure, interest rate, EMI amount and so forth. Have this handy when you talk to your lender. Tell your lender the genuine reason(s) that have rendered you unable to pay the EMIs, state your intention to pay your loan back as soon as you can, and ask them what their options are. If you have clean past loan records which you cleared on time carry them along. This in a way will help you gain their trust about your intention to pay the loan. If you have paid your EMIs on time until now, the bank knows you as a genuine borrower, and will take this into consideration when working together with you to find a mutually feasible solution. 'Genuine intent' to repay is the single largest thing that will work in your favour. Be sure to make it very clear to your bank that you do intend to repay and would like to work together to find a solution. Genuine reasons that banks understand are loss of a job, illness, or an accident that may render you unable to work. You might also have multiple loans and find yourself in too much debt to handle. Secondly, the bank is not keen to repossess your assets, it wants you to pay the money owed, or at least most or part of it. If you default, the bank's NPA ratio (Non-Performing Assets) goes up. This reflects badly on the bank's balance sheet. Also, they lose out on the money you would have paid them. So, the bank will much prefer to cut you a deal. Wondering if the bank can repossess your asset i.e. your car or your home? Legally, yes, they can. But there are a couple of reasons why you don't have to necessarily worry about this. Firstly, the repossession procedure in India (and in fact elsewhere in the world as well) is very lengthy and there are steps along the way where you and the bank can work together to come to a satisfactory deal. Bank will restructure your loan if the EMI is too high, if there is increase in overall interest rates, or an increase in your personal commitments, or a combination of these factors and others. If you are currently paying Rs. 10,000 per month for 3 years, and this is too high, the bank might offer you an EMI less than Rs. 10,000 per month, for a little more than 3 years. So, your EMI goes down, giving you some breathing room and the bank doesn't lose money because it will simply make it up from you over a longer period of time. Everybody wins on some level. Keep in mind that the payments you now make will eventually cost you more in terms of total money repaid. But this can be the breathing room you need. However, the extension in tenure will be small, so the change in your EMIs will also be small. May be the problem is not that you can't pay enough or you can't pay at all. If you are in a position where you feel that within a few months your financial situation will change, you will get a job and be able to start repaying your loan a little bit at a time, perhaps at a lower EMI, then you can approach your bank for deferral of your payments. The bank will grant relief, giving you a window of opportunity to calmly seek ways to increase your cash flows. Once the window closes, your EMIs will restart (on either the same terms or your new negotiated terms), but will include late payment penalties, known as Delayed Payment Charges. These charges are applicable for payments made after their due date. In case some of your post-dated cheques (PDCs) have bounced due to insufficient funds, you will also be subject to cheque bounce charges. This is something that for obvious reasons might not be feasible for a home loan, but it can work for a personal loan, credit card debt, or a car loan. On a case to case basis, banks are sometimes willing to go for one time or lump sum settlements of outstanding dues. They will waive some of the charges or some of the amount and charges, and you can pay the rest as a loan settlement. However, this is detrimental on your credit score. Getting a loan in the future, if you want one, will become either very difficult or very expensive, or both. Liquidation of assets can be your last resort. If none of the above options works, then you can liquidate your investments to service your debt. You can liquidate your deposits or mutual funds to pay EMIs. On the other hand, you can also use this amount to make part payments of your principal amount. Use PersonalFN's EMI Calculator to calculate your monthly EMIs now. What happens if you still can't pay EMI? At this stage, your bank will seek repossession of the asset. The asset will be auctioned off within 15 days (for a movable asset like a car) or 30 days (for an immovable asset such as a home). During this period, you still have the option of buying back your own property provided the funds are available to you. At no time during the process will the bank not give you the option to pay, in bits and pieces or via a reduced lump sum and maintain possession of your asset. While you could utilize a Personal Loan for almost anything and your eligibility is high, consider your needs. The objective is not to go overboard which can potentially jeopardise other long-term financial goals such as your retirement. Ideally, your monthly debt commitment should not exceed 40% of your gross income. When you're planning to avail a Personal Loan, make sure you discuss it with your family. Sharing your rationale with them will keep them well-informed and their opinions will help you gain a better perspective. And to your surprise, in times of a short-term cash crunch, they may even come to your rescue. Whatever be the case, keeping your family in the dark may not be in their best interest. Borrow only as much as you need and not as much as you can. Because borrowing money is easy but re-paying back might not be as easy. Understand your monthly cash flows (cash inflow and outflow) by prudently drawing up a budget. This is a good time to be realistic with yourself, because nobody else knows your repayment capacity better than you. Missing to pay EMIs on Personal Loan can cost you more, owing to a higher interest on default, penalty, late fees, and other related charges. Therefore, ascertain the loan repayment schedule and have a repayment plan in place. Study your income flow and make sure it is consistent. Account for emergencies, as life isn't certain. The only way to mitigate risk is to have a contingency plan in place. Compare your loan deals with all the lenders. You can even check for online personal loan options. Finally opt for the one which offers better loan terms with lower interest rate and lower fees. Once you've decided on the personal loan amount you require, organise your documentation and other paper work well, so that your personal loan application can be processed faster without going back-and-forth. Before making any impulsive purchases, evaluate whether your current finances permit such purchases. Splurging with the credit facilities can eventually land you in a debt-trap. Remember, personal loans are one of the costliest forms of credit facility. Hence, act prudently and avoid opting for loans for almost every purchase. Living within one’s means, safeguards one’s long-term financial wellbeing. Focus on the larger goals in life, such as buying a dream home, your children’s future and your own retirement, apart from a host of other ones. You can seek the assistance of unbiased PersonalFN’s Financial Planners who help you achieve your financial goals. Avail of PersonalFN’s Financial Planning Service to streamline your personal finances prudently. Apart from assessing your profile and reviewing existing mutual fund portfolio, our registered investment advisers will define the right asset allocation to meet your financial goals. Read more about the holistic financial planning process here. If you liked our guide or would like to give us a feed-back, please post a comment or you can even share it on social media. Take responsibility for yourself and your loved ones and follow the 5 Steps To Lead A Healthy Financial Life. Further, if you need superlative value assistance in financial planning, reach out to us on 022-61361200 or e-mail at info@personalfn.com . We will happy to hear from you.